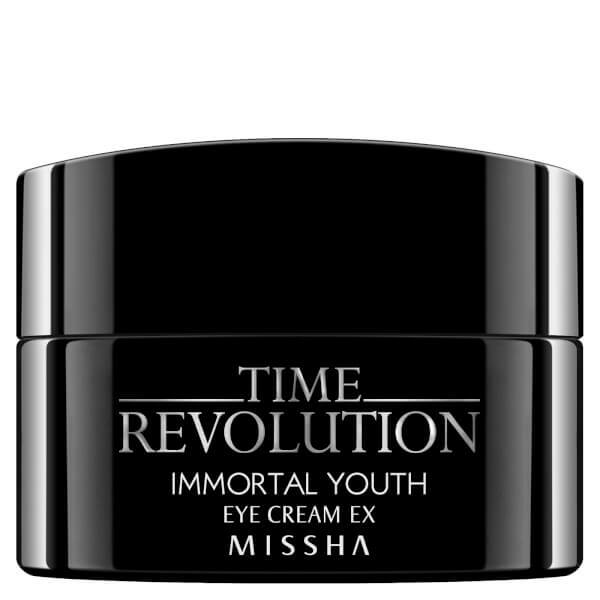 Turn back the clock with the Time Revolution Immortal Youth Eye Cream from innovative Korean skincare and cosmetics label MISSHA. Super-hydrating with powerful anti-ageing properties, the eye treatment helps intensively care for skin problems surrounding the delicate eye area, such as dark undereye circles, wrinkles and loss of elasticity by providing nutrients and moisture. 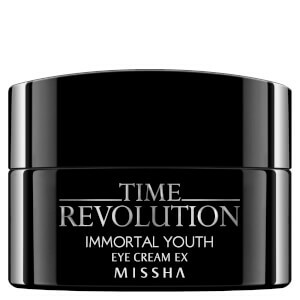 Eyes are left exuding youthfulness with improved texture and restored radiance. Use after Serum and before Cream. Use the mini spatula to get a small amount of cream and apply around eye areas. Gently dab with fingers to dissolve balls and massage until fully absorbed. Betula Alba Juice, Cyclomethicone, Dimethicone/Vinyl Dimethicone Crosspolymer, Glycerin, Butylene Glycol, Dipropylene Glycol, Niacinamide, Silica, 1,2-Hexanediol, Acetyl Tetrapeptide-5, SH-Decapeptide-9, Sodium Cocoyl Alaninate, Dimethicone, Hydrogenated Lecithin, Cassia Alata Leaf Extract, Adenosine, Hydrolyzed Myrtus Communis Leaf Extract, Reveratrol, Xanthopyll, Algin, Polyglutamic Acid, Titanium Dioxide, Phenoxyethanol.